Church bellringing is a unique English activity. Wherever the English have settled and built their churches, peals of bells would be included. As a result one can travel as far afield as Australia and New Zealand and hear the bells ringing in these far away churches. As a hobby Bellringing is a highly therapeutic pastime both physically and mentally. Learning to ring is also very satisfying. Once one has learnt to control the bell progress is down to one’s keenness to achieve greater experience. There are no exams or tests; you compete only with yourself and the desire to improve. 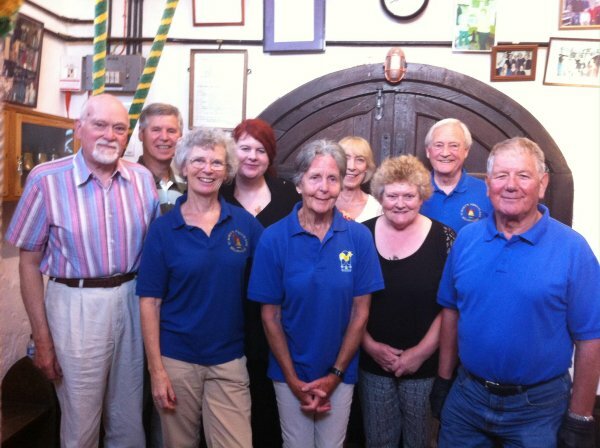 Bellringers belong to the Bellringing Guild. In Abbotts Ann the Ringers belong to the area Guild which is the Winchester & Portsmouth Diocesan Guild of Church Bell Ringers. Annual membership is but a few pounds a year insufficient to break any one’s pocket. Wherever you may travel if you visit another Church as a bell ringer you will always receive a friendly welcome. Ringing takes place on our practice night which is Thursdays and for church services when they are held in Abbotts Ann. Because we belong to a three church benefice that is with Upper Clatford and Goodworth Clatford services are rotational between the three. We therefore have a strong friendship with the Clatfords bellringers and both our groups are good humouredly known as the Abbotts Clatfords Bellringers. To add to our activities the Tower owns a set of eight hand bells which for many years lay hidden in the loft of the Eagle pub having been stored there as a precaution against the church being bombed during World War Two. The current ringing team are all novices at this somewhat different set of skills so if you would like to have a go at hand bell ringing, do come along and learn with us. St.Mary’s Church Bell Tower Hon. Officers. Practice Night:- Thursdays (as stated in the introduction above) from 7.30pm until 9pm. If the fun of ringing church bells appeals to you why not contact Alex and come along one Thursday evening and find out more. You’ll be surprised at how many of the ringing team’s faces are familiar to you.